Vinification & Aging: Harvested from 40 year-old bush vines, cultivated in the traditional system (low yield, no irrigation). Fermented in temperature-controlled stainless steel tanks. Maceration lasted 12 days. After the alcoholic fermentation, the wine remained in stainless steel for 8 months and was then transferred to French oak barriques for 4 months prior to bottling. 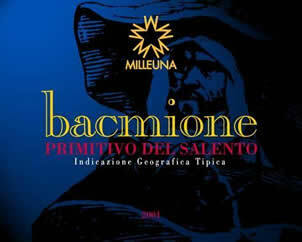 Description: Powerful, full Primitivo. The wine is complex and elegant, balancing the ripe fruity flavors typical of Primitivo and the warmth of the Mediterranean. Food Pairing: Pasta of all kinds, ragout sauces, meat dishes.